Does your church have this amazing worship tool yet? Piano in Worship DVD/book is now on six continents (the penguins on Antarctica love to worship but they can’t play the keys very well). We hope to get a copy into every nation and every God-seeking church around the world, transforming worship everywhere it goes! Worship Without Borders continues to influence and encourage worship around the world. This product is now in 35 nations and 42 states – hundreds of pianists/keyboardists around the world have been released in creative worship for their churches. 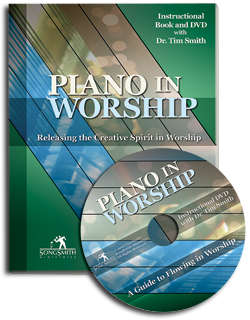 We are offering the amazing Piano in Worship DVD/book for a greatly reduced price of $29.95 and if you buy the DVD separately: $19.95; or the book separately: $15.95 (we send you this in pdf format)! Help us touch your church by getting your own copy and/or send one to the worship pianist in your life! It’s definitely a worship-changer everywhere it goes! We want to make it available to all those churches, worship leaders and musicians who aspire to greater creativity and expression in your worship. This amazing and unique worship resource gives you a fresh look at some of the great songs of the church (CCLI top 25, hymns, etc.) as well as ideas for prayers, quiet moments, offerings, etc. It’s been exciting to send orders to Japan, Brazil, Australia, India, Thailand, Finland, Mexico and other nations around the world! We hope you can get your own copy and release your creativity in worship. Piano in Worship is an instructional tool for releasing creativity in worshiping pianists and keyboardists. Hundreds of students around the world have been set free over the years in creative worship through this book. Now on DVD, thousands more will be able to see and hear the unique yet simple patterns that Dr. Tim has used in worship for years (called ‘worship bridges’ or vamps). Using these basic yet creative techniques, the worship pianist can play virtually any song in any key as well as play during free-flowing moments in a worship service (i.e. during prayer times, testimonies, Bible-readings, altar calls, etc.) Check out Worship Bridge 1 for your first lesson online! Many current songs from CCLI‘s top 25 like ‘How Great is Our God‘ and ‘Mighty to Save‘ are illustrated as well as some worship standards like ‘I Exalt Thee‘ and ‘I Love You Lord‘ and some hymns like ‘Holy, Holy, Holy‘ and ‘The Solid Rock‘. Dr. Tim shows how to modify each bridge to make every song come alive in a fresh new way. If you don’t play the piano or keyboard, consider sending this DVD/book as a gift to someone who does or maybe a church or school you know could use it! All proceeds from this amazing resource will help further the ministry of Worship Without Borders as we ‘go into all the world’ releasing worship of Jesus Christ. Thank you for investing in transforming nations in worship. Hilde Austad Stevenson , Vancouver, B.C. Ashish Joy , Vancouver, B.C.